Life with kids on New Years Eve is quite different than it was before them. This year we bought some fun goodies to have with dinner and opted to stay in thanks to the snow that was dumped on us during the day. NHL asked if he could stay up to see 2009 start. We figured it could not hurt to let him try. 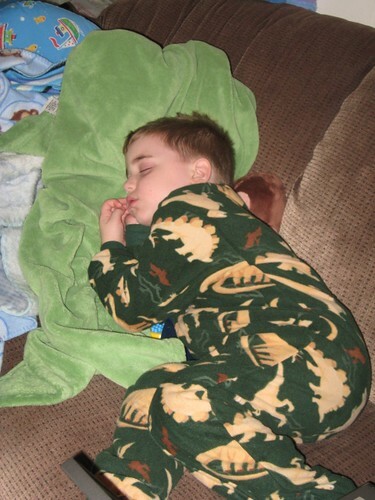 Of course, our theory was that he is five and typically goes to bed at 7:30. The kindergarten kid shocked us. He was pretty alert (albeit cranky) most of the evening. 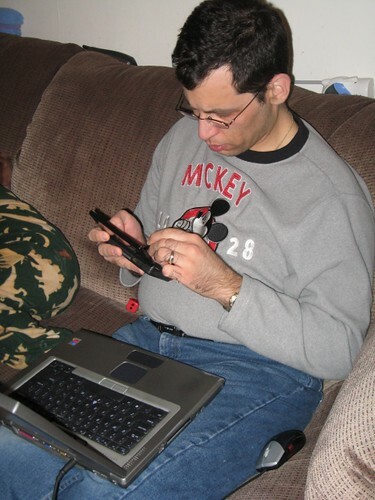 He played on the computer, watched the Travel Channel about Disney World, and used the Nintendo DS with JL. The little guy slept though most of the evening. He woke up once, but was in his crib from 9:30 to 7:30 this morning. Now with the New Year here the reality that we have a vacation planned THIS YEAR (in four months no less) is real! Wishes for a Happy and Healthy 2009 to everyone. P.S. Hubby and I are supposed to go out to dinner tomorrow night. We opted for a more quiet evening. Good thing thanks to the awful weather here. How brave (Disney). lol. We did that years back when ours were little. It left me very stressed. ha ha ha! How cute to see the little guys fell asleep. so funny! He’s texting and on the computer….lol!! How cute. He really tried to stay up didn’t he. I remember when my daughter was that age I think she did the same thing. I hope you have a Happy New Year.